GOOD MORNING FRIENDS! 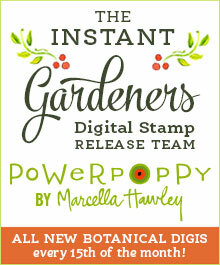 Yesterday, Power Poppy released TEN new digital stamps for images that were previously available only in clear format. I’ve been on a coloring frenzy the past few days, making up for lost time when I had to limit Copic time due to tendinitis in my elbow. I’m back today with a familiar image. I recently taught a class at the Queen’s Ink featuring an image from the Bough Wow Wow stamp set which featured non-traditional holiday colors. So when Marcella released the same image as a digital stamp (this time as Mittens and Merriment), I decided to make another card, this time using more traditional Christmas colors. I rummaged through my stash of holiday themed paper and found that I still had a sheet of Vintage Christmas Three by Authentique which mimicked the snowflake pattern on the mitten. By using the digital version, I was able to scale the image as necessary so that I could also incorporate one of my lesser used dies for something different.